← Mammogram Screening Makes No Difference to Breast Cancer Mortality Rates? Seriously? I recently wrote a post on forced and arranged marriages in the UK and the new Freedom Charity launched this year by Aneeta Prem, backed by heavyweights in the political and celebrity arenas. During our weekend perusal of the international newspapers, my spouse alerted me to an article published in last weeks The Guardian (UK) paper. An article not just about the concept of forced marriage but the experience of a woman, Jasvinder Sanghera, who ran away from home to avoid the fate of her four sisters who weren’t so lucky. What it has to say about her own experiences and those of girls she has since helped is inspiring. She blows away the myth that only girls from poor and uneducated families are at risk. I make no apology for reproducing the article in full, with due credit to The Guardian newspaper and journalist HomaKhaleeli. I’m off the check out Jasvinder’s autobiographies Shame and Shame Travels, both mentioned in the article. I hope you take the time to read it – if you have daughters, granddaughters, sisters or nieces you should. It is only through education, awareness and recognising the problem for the barbaric practice it is, that victims will feel able to step forward knowing they can seek help and be taken seriously. Read it for those girls who will no longer be enrolled in school for the next school year. Jasvinder Sanghera has long campaigned against forced marriage but, she says, it is still widespread – and thousands of girls will not return to the UK after the summer holidays. Rolling hills, stone cottages and a pub where customers are greeted by name – the Yorkshire village that Jasvinder Sanghera now calls home is a chocolate-box vision of England. It may not be the obvious place to find a woman who campaigns against forced marriage, but it doesn’t take a psychologist to see why it suits her perfectly. Brought up in a close-knit Sikh community in Derby, Sanghera watched as her four older sisters were taken to India, one by one, to wed men they had never met, each becoming trapped in a violent marriage. At 15 she ran away to escape the same fate; only to be disowned so completely by her family that her mother told her she considered her dead. Years later, after one sister killed herself to escape domestic abuse, she set up the charity Karma Nirvana to help smash the culture of silence around forced marriage. It is a story she tells often – in her books, on TV, to police and social workers, and to the scared young women and men who ring her helpline. She has faced public abuse and even death threats in her bid to expose the rigid system of family “honour” that is at the root of such marriages. So it is not surprising she has chosen to live in such a quiet retreat – or that she asks me not to give its name. Yet in Shame Travels, the 45-year-old activist’s latest book, her prediction is turned on its head when Natasha gets engaged to a Sikh whose mother welcomes them with open arms. “Here was an Asian family who have encouraged their children to be independent, to respect different values. I have never seen that before,” she says. The warm relationship sparked a journey to India to seek out a long-lost half-sister whom Sanghera had been banned from visiting in case the “dishonour” she had brought on her family in England infected her. Her sister was thrilled to see her, supportive of her decisions and happily agreed to attend Natasha’s wedding to make up for all the family members who turn their faces away when they see her. “It was hard for me to reconcile my [Asian heritage],” Sanghera explains, “but I feel like now I have. This book, for me, is almost like the final journey.” As if to underline this point I notice that, despite her conversion to Christianity, glinting beneath her sleeve is a kara, the steel bracelet that is not just a mark of identity for Sikhs, but a reminder to behave with honour. 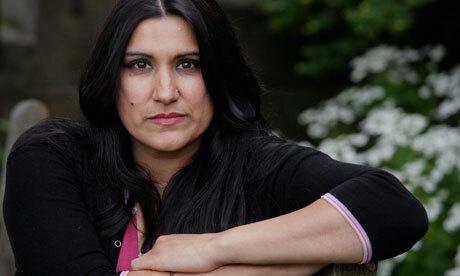 Sanghera’s campaign to expose the rapes, domestic violence, and even honour killings and suicides that can result from forced marriages has garnered political success, while her 2007 autobiography, Shame, catapulted the issue into the media spotlight. The fluency with which she reels off statistics hints at the thousands of lectures and talks she has given. Yet when I ask if all this exposure means things are getting better, she insists the scale and complexity of forced marriages – and “honour killings” to which they are intimately linked – is still not recognised. The 500 or more calls a month to Karma Nirvana and the 400 survivors of forced marriage rescued and repatriated by the Foreign Office’s Forced Marriage Unit every year is just “the tip of the iceberg”, she says. Because the average victims are girls aged 14 to 19, she says summer holidays are “the most dangerous time. There will be thousands of girls who don’t come back in September.” The last call she took to the helpline brought this into sharp relief. The caller was a terrified 14-year-old from the north of England, who, “is always in conflict with her family because she wants to see her friends at the weekend and they don’t let her, so they said they will ‘sort her out’ in the same way they sorted her sister out”. Her sister was taken out of school and sent to a village in Pakistan for two years to be “rehabilitated”, then married and brought home. Survivors such as this are often let down by the authorities, Sanghera says. “Often professionals will look at them with sheer disbelief.” Others are simply unaware of the powers they have to protect victims; at one of the charity’s roadshows (held for agencies such as the police and social workers) 75% of attendees had never heard of the Forced Marriage Act. This allows courts to issue orders that can prevent families from taking victims abroad, forcing them to hand over passports, or reveal the victim’s whereabouts. Between November 2008 and February 2011, more than 250 orders were made, according to Sanghera (more than half to protect those under 16, and some for children as young as eight). Yet few of these are monitored, she says, and breaches are not dealt with seriously. So far there has only been one imprisonment. All other breaches have been dealt with by community orders or fines, including those involving threats to kill. Those survivors who are strong enough, she encourages to follow her lead and tell their own stories, as a counter to the ostracism and silence they face in their communities, either as volunteers on the charity’s helpline or at public talks. “Statistics can be ignored, but what moves a fellow human being is that sitting opposite you is someone who has suffered abuse by the person or people who are supposed to love them the most.” Some argue that such narratives turn forced marriage and “honour violence” into cultural issues, rather than another form of gender violence, and lead to ethnic minority communities being labelled as barbaric. • Shame Travels is published by Hodder & Stoughton, £18.99. This entry was posted in England and Things English, Politics and Social Comment, Women and Female Related and tagged Aneeta Prem, domestic abuse, Forced marriage, forced marriages in the UK, Freedom Charity, honour killings, honour killings and forced marriages in the UK, Jasvinder Sanghera, shame by jasvinder sanghera, shame travels by jasvinder sanghera. Bookmark the permalink. A parent’s instinct is to protect his/her child(ren) if this instinct fails then they are committing child abuse. These girls forced into what is often violent marriages need to be, like all other children being abused, protected by law. I salute the people campaigning for these laws – and doing so much more for these girls. I think half the battle has been that the public cannot believe such abuse does take place each year in Britain. That it must be dramatised. To go against your culture and expose this abuse is a hugely brave thing to do, especially when honour killings are taking place in these same communities. Jane, interesting article. This sort of thing (forced marriage and domestic abuse) is rampant among certain segments of the Asian community, although I personally only know of one individual who faced a similar situation – she was from a Sikh family, someone who was at uni with me. All the Indians and Pakistanis that I know are of the “respect the individual” type, although the inclination to respond to “what will people (ie in our community) think?” is one that runs through the psyche’s of most all Asians of the older generation. One often finds that people in the subcontinent (well middle class people anyway) have progressed in their views whereas people who emigrated stay put in the same mindset they experienced when they left. Thank you so much for your input Poonam. This is something I wouldn’t have thought existed in the culture of westernised Asians living in the UK. I haven’t met any Asians who would think this is in any way acceptable. That it is happening to young girls, some who have been born and raised in the UK, is abhorrent to both Asians and British alike. I think your comment “one often finds that people in the subcontinent (well middle class people anyway) have progressed in their views whereas people who emigrated stay put in the same mindset they experienced when they left” is absolutely right and true of any culture, not just the Asian one. Perhaps it’s something we all tend to do when we find ourselves in a foreign culture – we cling to what we know, when our home country has moved on in ideas and attitudes. Great area for discussion! This post and the concept of forced marriage illustrate the intersection of cultural beliefs and individual freedoms. Plenty of cultures value society above the individual, but the pressure to conform (albeit intense) is emotional, not physical. Thanks for writing on such an appalling topic that deserves our attention. Like Jane, I’d love to read these books, in book club would be great. Thanks Linda, the more I think about this subject the more unbelievable it is that a culture can exert such terrible pressure to conform. I think Poonam has identified part of the difficulty – that people emigrating to a new culture take their own with them and cling to it, even when those same customs and behaviours evolve and change back in the home country. A tough issue. Let’s add these to the next book club list. Guess I’ve no excuse NOT to check them out!